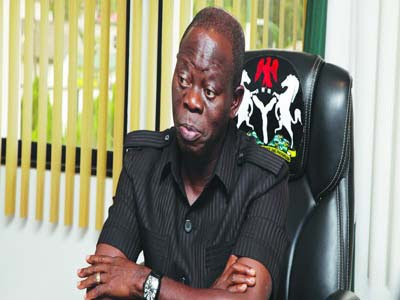 A MINISTER in former President Goodluck Jonathan’s administration stole $6 billion, Edo State Governor Adams Oshiomhole said yesterday, quoting United States (U.S.) officials. Oshiohmole, in a chat with State House correspondents shortly after meeting President Muhammadu Buhari at the Presidential Villa, Abuja, said: “The PDP (Peoples Democratic Party) destroyed the country. I mean from the lips of American officials; senior officials of the State Department said one minister under PDP cornered as much as $6 billion. “So, PDP is a party that presided over the liquidation of our nation; destroyed all our institutions; converted the Armed Forces commanders to use them as if they were political thugs; converted NTA to a party megaphone; destroyed the SSS; went after opposition as if we were rabbits to be pursued into our holes; compromised even student unions and destroyed everything that you can think of; and elevated religion to a state affair. “Under the party, Israel became a place you visit every week; they placed pastors against Imams, placed North against South, East against West – just to retain power; elevated Obas and Obis with dollars. “You guys were reporting dollars that were changing hands; when NNPC (Nigerian National Petroleum Corporation) was spending much more money than was available to the Federation Account. “We are a very patient people. If we were not a patient people, anybody wearing the tag of PDP ought to feel very unsafe because you are all victims – all of us here. “What he said, for me, was quite instructive, compared to what he said last week. Then I was present when he said ‘you know, we who see ourselves not just as friends of Nigeria, each time we think there is light at the end of the tunnel and it is time to encourage Nigeria to build on it, you would wake up the following day under President Jonathan to find out that even the tunnel had been removed. “Those were the words of Mr. Carson. Now, last week, this same Carson chaired the President’s address at the Institute of Peace and he said ‘we now have a man of enormous integrity; one that has shown so much faith in the democratic process; one that refused to be frustrated even in the face of massively rigged elections. He submitted to the judicial process and even when that was compromised he never gave up. “America has done its check and we are convinced that this President is the one that Nigeria needs at this time to regain its leadership of the African continent. He took a swipe at the PDP, saying the party destroyed Nigeria. Oshiomhole, who was a member of President Muhammadu Buhari’s delegation to the United States, was delighted that Nigeria now has a President who talks with confidence unlike “a President that is blabbing and is not sure of what the issues are”. He said he had decided not to bother about anything the PDP says about the present administration because he did not expect the party to be praising a government that is doing better than it did while in charge. He said the PDP succeeded in supervising Nigeria’s liquidation. Oshiomhole claimed that under the PDP, there was no law as the party’s members were a law to themselves. He claimed that Jonathan did not know what the issues were and everybody was frustrated.